Since time immemorial, people have been collecting things, whether because they are simply interested in the item being collected, or because they feel that the collectible in question will be worth more money than they originally paid for it. It is fun to look back on history and see how things have changed over the years, or marvel at the little time capsules you have collected. If you are a collector, or thinking about getting into collecting, below are 2017’s collectible trends and what to know about them. This trend has been going strong for a couple of years now and shows no sign of stopping. 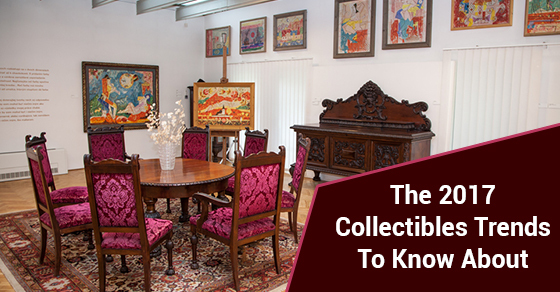 Whether people are collecting furniture from this era as art, they have it strategically placed around their home as show pieces, or they are simply stashing it away in a cheap self storage unit, these collectibles are quite popular in 2017. Art and glass deco are still popular collectible items in 2017 because they are still holding their value quite well and are relatively inexpensive investments (especially when you consider the cheap self storage requirements they have). One thing to think about when deciding on a collectible is how well it is going to hold its value. If you are collecting simply because you like the piece, then this is of secondary importance, but if you collect as an investor as well, then collectibles which are predicted to hold their value are important. Vintage automobiles and firearms have pretty much held or raised their value over the past 100 years. One of the main things to keep in mind about collecting vintage cars and firearms is whether or not the item is an original. Kit cars that are exact replicas of originals are quite popular, but because they are not authentic, they are not worth nearly as much. Same goes for old fire arms. For instance, the M1 Garand, the rifle issued to American infantry during the Second World War, is still manufactured, as a replica, to this day. They look and feel identical to their original, but they aren’t actually from the time period, and are not considered collectibles. Cheap self storage is a great way to store collectible items while maximizing your return on investment. If you are considering getting into the collection game this year and don’t know where to begin, keep the above 2017 collection trends in mind, and spend your time and money wisely.